Garuda Seva on the day following Thai Amavasya is very famous. Access to the temple Near to Vanpurudottamam; Center of north prakara of Thirunangoor. The Moolavar of this sthalam is Vaigundha Nathan. Other name of the Perumal is Thamarai Kannudaya Piraan. The Moolavar is in the Irundha (Sitting) Thirukkolam facing his thirumugham towards east direction. 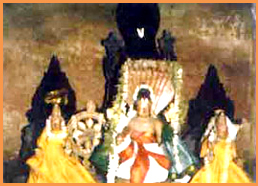 Prathyaksham for King Uparisaravasu and Udhanga Maharishi.. This sthalam is also one among the Thirunaangur Divyadesam and lies in Thirunaangur in Tanjore district in Tamil Nadu. Bus facilities are also available.